As anyone who came of age in the 70s, 80s or 90s can attest, television reruns from eras past were a major part of our upbringing. From I Love Lucy to Gilligan’s Island, and everything in between, those shows all had one thing in common. The lack of a fitting ending for the characters we knew and loved once the series ended. What would the ending of some of our favorite shows we grew up watching in reruns be like? Would Lucy and Ricky have stay married or divorced and co-parented? Would the Professor and Mary Ann have gotten together while the Skipper and Gilligan coupled up? These are questions each of us have likely pondered at one point or another about certain TV shows along the way. 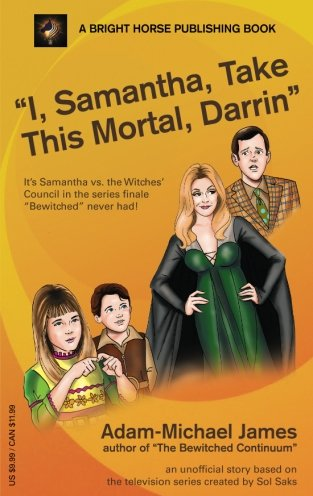 Fortunately for us, we now have a fitting ending to one of these shows, the iconic 1960’s television series, Bewitched in a book titled I, Samantha, Take This Mortal, Darrin. Written by Bewitched historical expert Adam-Michael James, his just-released book gives the satisfying finale and ending the characters on the show never experienced. Thoughtfully written with dialogue that illustrates the characters themselves saying, the book gives the Bewitched cast a two-part sendoff that ties up all the loose ends. Drawing upon the great history of this beloved show, the book even features citations and an impressive and detailed appendix to reference what episode certain characters and quotes were featured in the series.